ACQUASANTIERA IN RESINA DECORATA WITH FREGI DORATI. APPLICABILE TO PARETE. IMMAGINE RESINATA DI SAN PIO. ACQUASANTIERA CON TERMOMETRO IN RESINA EFFETTO PIETRA APPLICABILE A PARET. 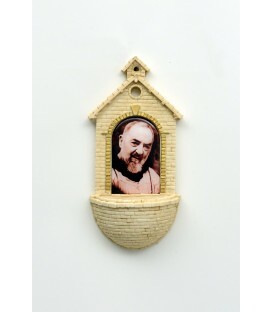 IMMAGINE RESINATA DI SAN PIO. Diptych in thermopolymer, folding closure with golden hinges. 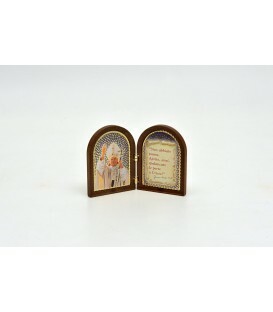 Four-color printing and hot gilding of the image of John Paul II and of his thought. Back decorated with relief frieze. 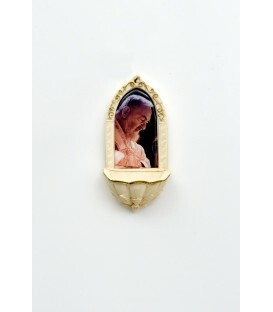 POCKET MIRROR WITH SAN PIO STAMPED IMAGE IN QUADRICROMIA. 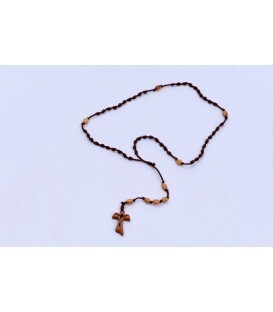 Rosary in colored glass, formed by grains in the shape of a rhombus. Ligation in silver metal. Medal with image printed in four-color resin depicting Saint Pio. Crucifix in silver metal in relief. 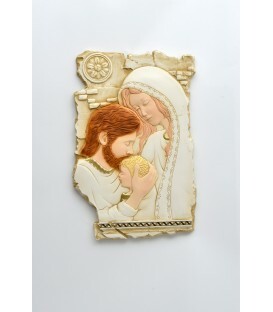 LOW RESIN RELIEF WITH INTARSIO, REPAIRING THE HOLY FAMILY PAINTED BY HAND. PRESENCE OF HOLE ON THE BACK. LOW RELIEF IN STONE WITH INTARSIO, DEPICTING THE HOLY FAMILY PAINTED BY HAND. HOLE ON THE BACK AND FURTHER SUPPORT IN RESIN FOR SUPPORT. 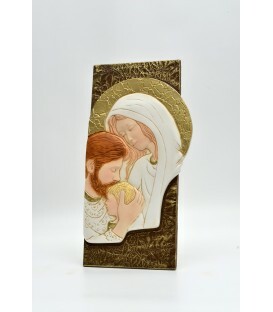 FRAMEWORK OF RECTANGULAR SHAPE IN STONE, REPAIRING THE HOLY FAMILY. HAND MADE ON BROWN FONDO. PRESENCE OF HOLE ON BACK OR SUPPORTS FOR SUPPORT. 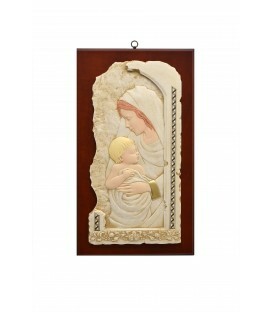 STONE BAS-RELIEF WITH INTARSIO, ON WOODEN BASE, DEPICTING THE MADONNA WITH A HAND-PAINTED CHILD. PRESENCE OF HOOK ON THE BACK. SAN PIO SHEET 30X40 CM. 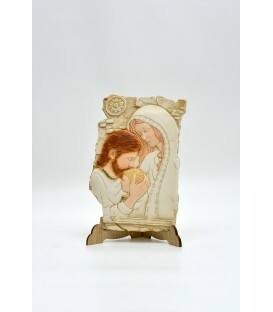 QUADRETTO IN TILE WITH WOODEN FRAME. 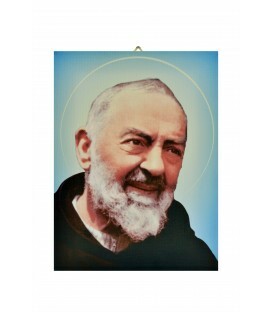 PRINTING IN THE QUADRICROMY OF THE PICTURE RAISING PADRE PIO AND OF HIS "THOUGHT". APPLICATION ON METAL HOOK RETRO. 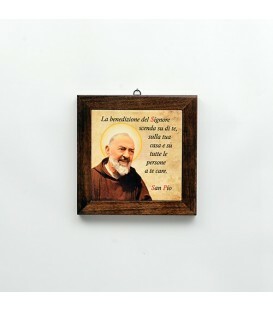 QUADRETTO IN PLEXIGLASS WITH ENGRAVING IMAGE AND A THOUGHT OF SAN PIO DA PIETRELCINA. 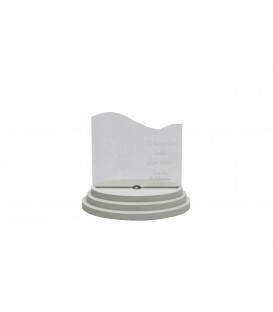 WOODEN OVAL BASE WITH INTERNAL LED. SQUARE BOX IN WHITE CERAMIC. COVER WITH PARCHMENT BACKGROUND AND STILL IMAGE STILL SAN PIO DA PIETRELCINA AND ITS BLESSING.